Groupon today announced its financial results for the second quarter of 2012, its third quarterly earnings report since its initial public offering in November 2011. 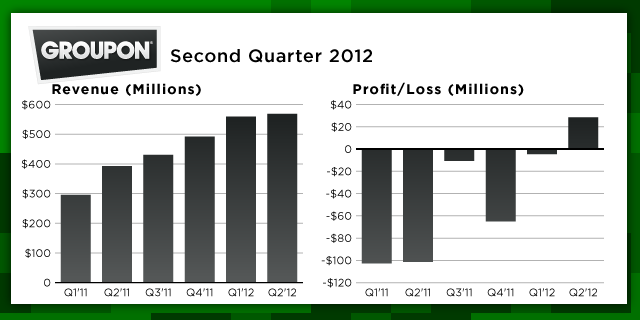 Groupon’s revenue for the second quarter was $568.3 million, up 45 percent year-over-year. Revenue was up 1.6 percent on a quarter-over-quarter basis, compared to the $559.3 million Groupon brought in during the first quarter of 2012. These top-line Groupon’s results were lower than analysts expected — the average of analyst expectations for Groupon’s revenue was $574.8 million. However, the company had a stronger-than-anticipated performance at the bottom line. Groupon’s net income for the second quarter was $28.4 million, or $0.04 per share — which is a boost from the average of its Wall Street analysts’ estimates for the quarter which was $0.03 per share. Groupon has had a rough go of it on the stock market in recent months, and it doesn’t look like today’s mixed results will give it the boost it needs. At market close today its stock was trading at $7.55 per share, a major fall from its $20/share IPO price. In after-hours trading the company slid even further — 15 minutes after the company’s earnings release hit the wire, the company’s stock was down more than 13 percent, to $6.51 per share. Looking ahead, though, Groupon is optimistic that its quarter-over-quarter growth will pick up: The company said it expects its third quarter revenue to be between $580 million and $620 million,with income from operations expected to be between $15 million and $35 million.